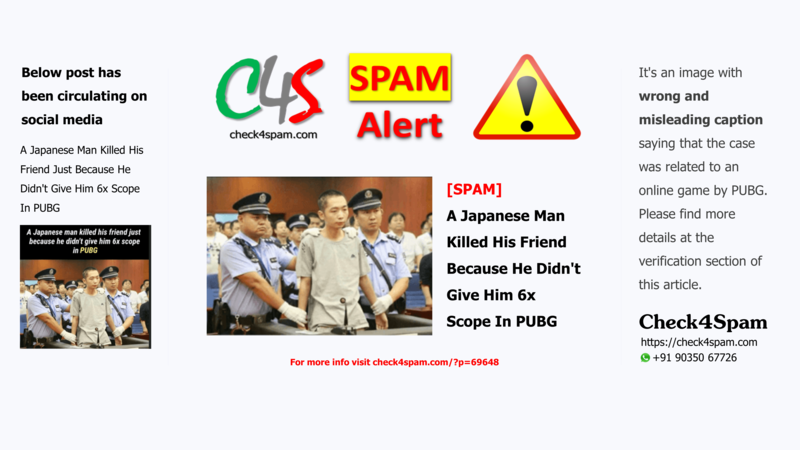 It’s an image with wrong and misleading caption saying that the case was related to an online game by PUBG. Please find more details at the verification section of this article. This is an image circulating on social media with wrong headings. This is an image from a news from Beijing, China and not from Japan. The accused had killed 9 students from the same school he studied from. The reason behind the killing was the anger he felt over bullying he suffered as a child in the same school. Accused Zhao Zewei bought five knives online for his attack on the school in Shaanxi province. It is very clear if we carefully look at the image, men holding the person accused are Chinese Police men. One can easily find out by the kind of caps the police wear. Check the image shared below. First is Chinese police cap and second is Japanese police cap. PUBG is an online gaming app and the image has nothing to do with this online gaming app. We need to be careful about such false messages that fool us on social media. Please check at Check4Spam/Nokiye before you fall for fake news. Read More About the True Story. Greetings to you too.Thank you very much. Useful information. Lucky me I discovered your site by accident, and I’m surprised why this accident didn’t came about earlier!